The top three Holstein lots averaged +2900 GTPI. 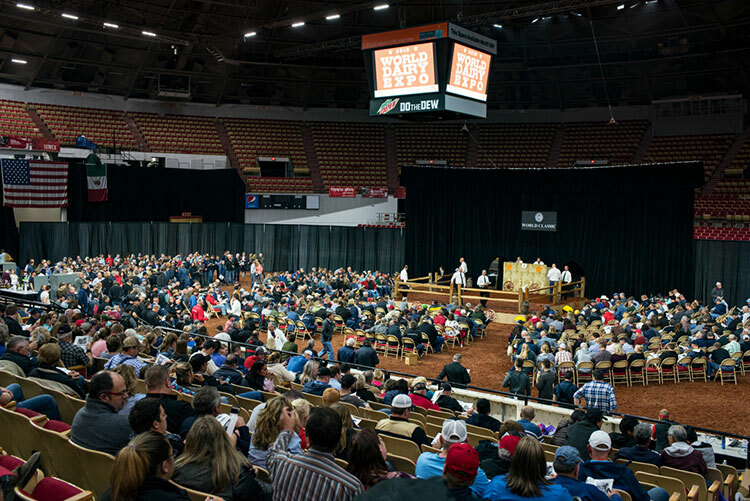 The World Classic Sale lineup offered something for all buyers, from heifers with huge genomic numbers over 2900 GTPI to daughters of the world’s greatest show cows classified up to EX-97. But, the top sellers of Friday night’s sale were the elite in the genomics world. The high seller was Lexvold Rolan Anne-ET at $205,000. Anne was born in May of this year and has a GTPI of +2930 and hails from the same family as Apple-Red, the well-known Red and White brood cow. She was consigned by Larry Lexvold of Goodhue, Minn., and purchased by Westcoast Holsteins of Chilliwack, B.C., Canada. AOT Fabulous Mary-ET was the choice of Select Sires of Plain City, Ohio for $125,000. This heifer is just three months old and sold in absentia. Her GTPI is +2900. The consignors were AOT Genetics and David King of Valley Falls, N.Y. The third-high seller was G-DeRuyter SprSprg 51662-ET at $110,000. This OCD Superspring daughter has a GTPI of +2881. DeNovo Genetics of DeForest, Wis., was the successful buyer. She was the consignment of George DeRuyter of Outlook, Wash.
Fifty Holstein lots averaged $34,966 and grossed $1,748,300. Cattle headed to 11 states and three countries. The World Classic Sale was managed by Tom Morris Ltd.